I have another nice story to tell about a wild horse that we rescued and what has happened in it’s life. 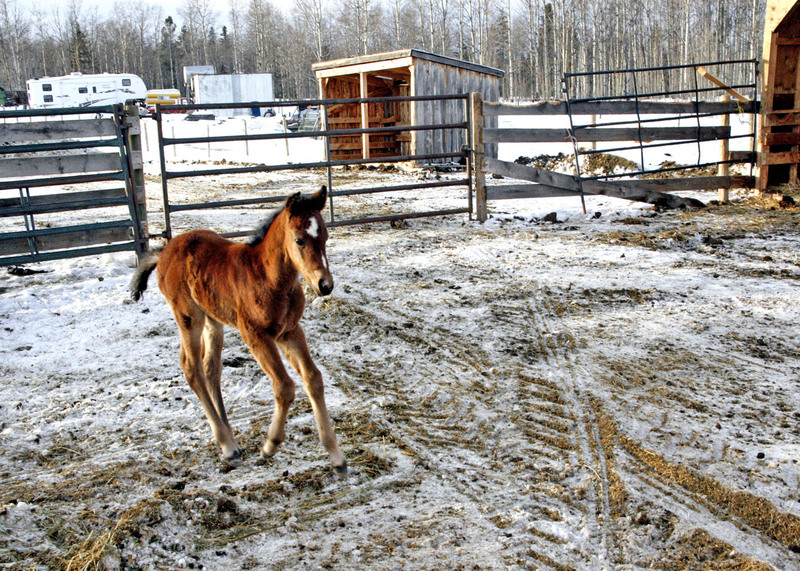 A couple of years back, WHOAS rescued 13 wild horses that had been caught up by a horse trapper. Their stories of rescue and the new homes we found for them, have been posted in previous blogs. This is a story about one of the young studs that were in that group. Jack Nichol took two of the young studs in an act of kindness and with great hopes of making a matched driving team out of the pair. Both looked so very much alike that he knew that they would make such a fine team. Jack worked with the two, who he named Mike and Pat, gentling them down and beginning the process of breaking them. However, both the boys, at two began to feel their oats and it became time to geld them. It was arranged to have the vet come out in a few days do this. Mike must have known. A gate was accidently left open and two of the mares that belong to Dan and Karen, where Mike and Pat were calling home, just happened to be in cycle right then also. By the time the gate was noticed, Mike must have done his job. A few months passed before it was noticed that two of the mares looked like they may be pregnant. One of them, Cricket, a pretty black, who is also out of wild horse stock, was thought to be just a maybe, as she showed less sign. An eye was kept on both mares however. Then on a very cold morning in the second week of January, Dan arose and looked out the window. There in the pasture was Cricket with a brand new foal lying beside her. Dan and Karen were out the door right away. They scooped up the foal in blankets and quickly got him and Cricket to the warmth of the barn. With a little bit of effort they got the foal to start to suckle on mom. His journey in life, although off to a little bit of a rough start had began under the loving care of Dan and Karen and of course Cricket. Cricket’s foal and the young wild horse foal, mentioned in the previous story, were probably born within days of each other. When we visited them the foal, who they named “Little Jack” was doing so very good. He was full of energy and running about the pen, as Cricket stood patiently by watching us carefully and antics of her foal. Just another little side note. 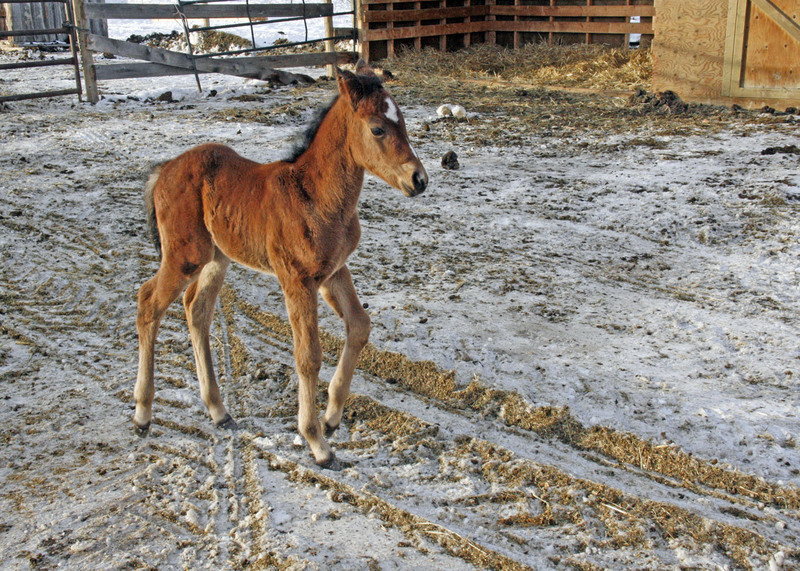 In earlier stories this year, I told you about two young wild horse foals that had been rescued from sure death, “Lucky” from the Sundre area and “Tia” from south of Bragg Creek. 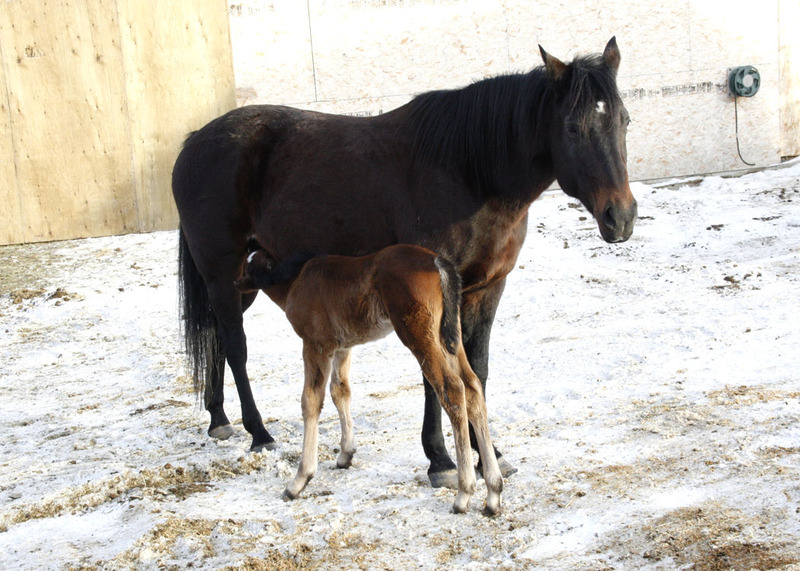 As it turns out and isn’t it a small world, both foals are now at the same boarding facility just south of Calgary and now are playing together. Oh by the way, both Mike and Pat are doing great. They have been in harness and hooked up to a sleigh and a wagon. This summer Jack hopes to have them going full time as a team. I just love that it shows the wild horses can be trained to do anything.